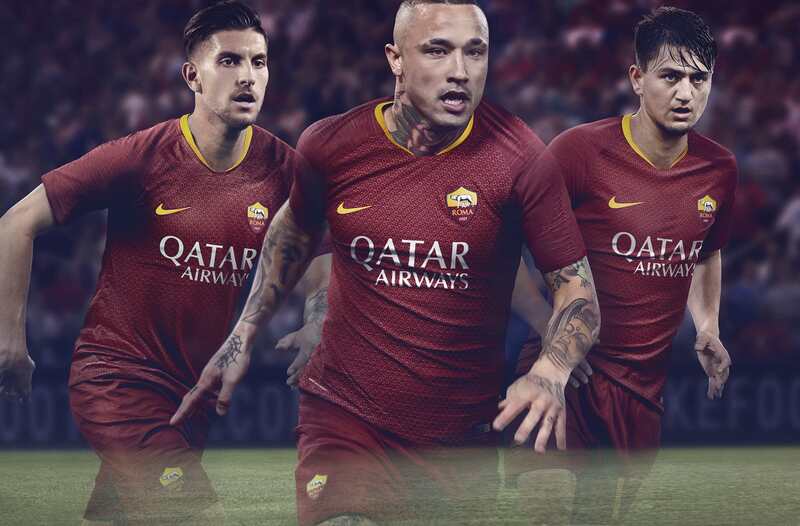 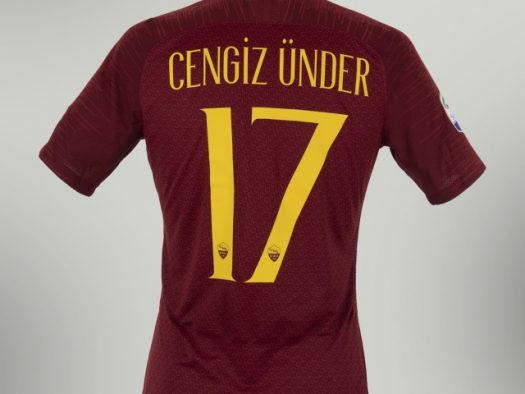 Italian club AS Roma have presented their new home kit for the 2018/19 season, featuring star players Radja Nainggolan, Lorenzo Pellegrini and Cengiz Under. 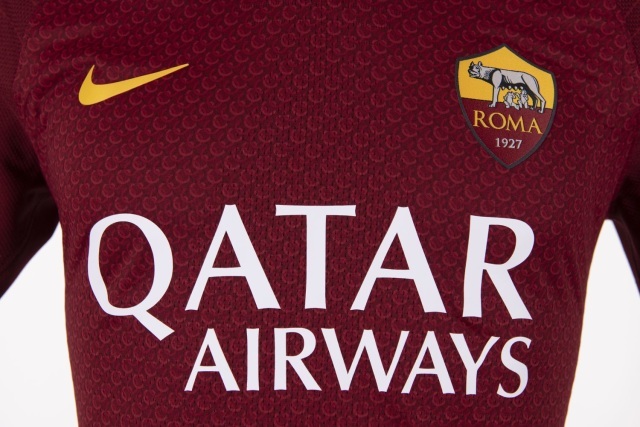 For the first time in five years it features an official shirt sponsor in Qatar Airways. 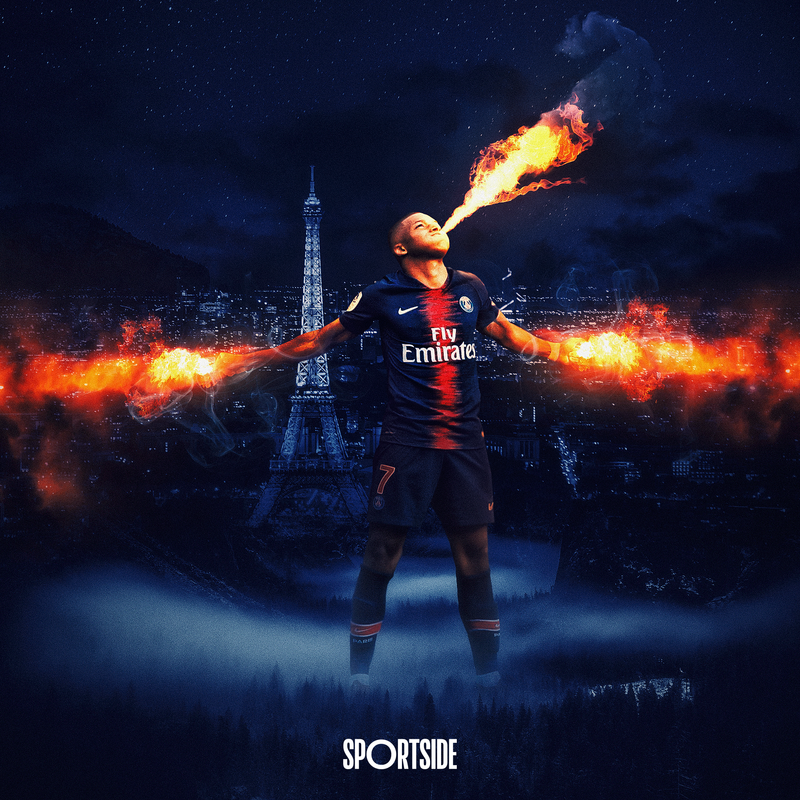 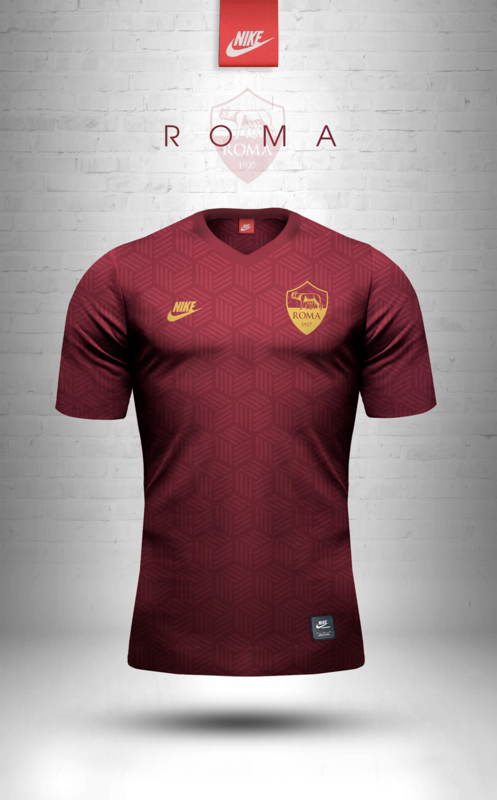 Produced by Nike, it is based on the latest version of their Nike Vapor global template, used for all their World Cup and 2018/19 club kits. 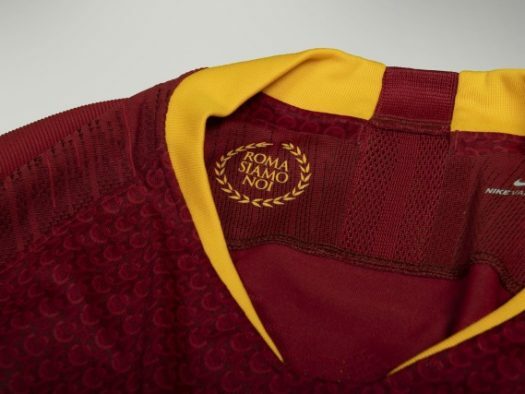 The most striking aspect on the kit comes in the form of a ‘chainmail armour’ pattern – dubbed Lorica Hamata, the chainmail armor worn by soldiers in ancient Rome – across the front of the shirt. 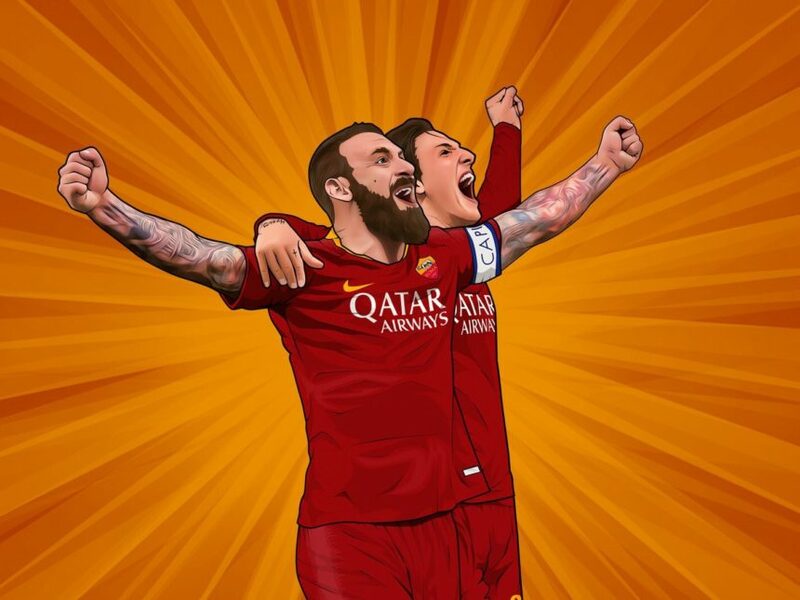 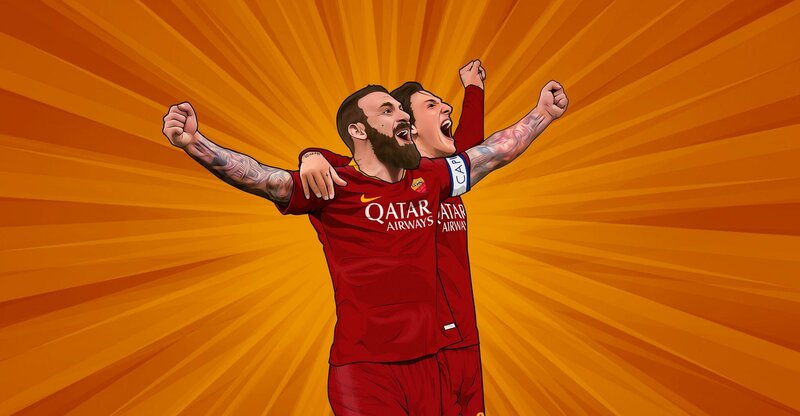 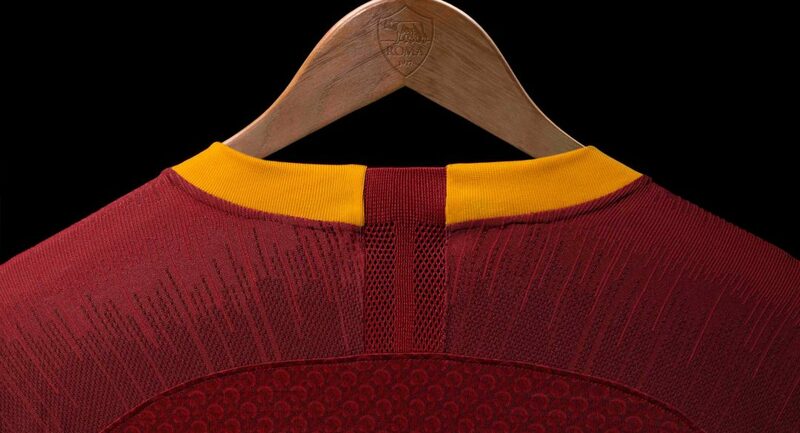 As rendered, the links are meant to represent the unbreakable bond between AS Roma, the city and the club’s fans all over the world. The chainmail armor is an interesting concept that looks very neat and stylish when viewed up close (see video below), but from a distance the pattern may look a bit too decorative and muddled when viewed in action, and I wonder if it could’ve been a bit larger (perhaps like this). 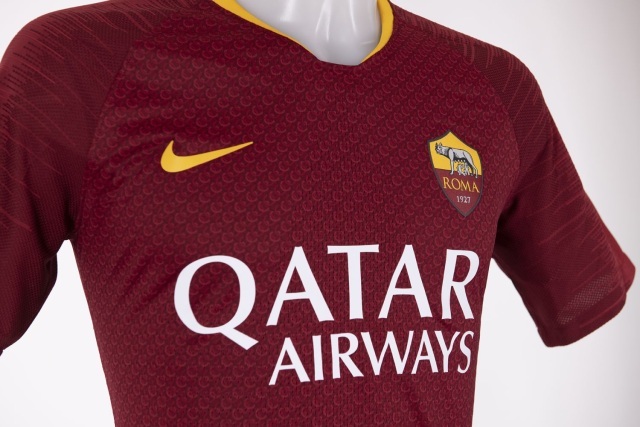 There is also an uneasy contrast between the chainmail, the shoulder and arm Vapor dashed pattern. 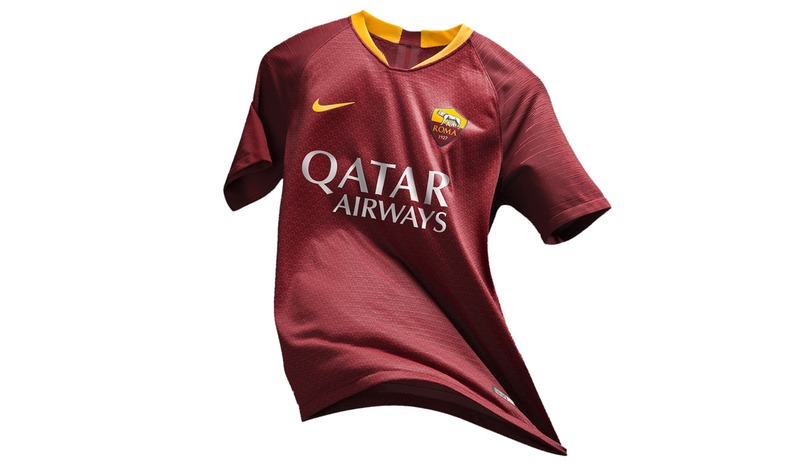 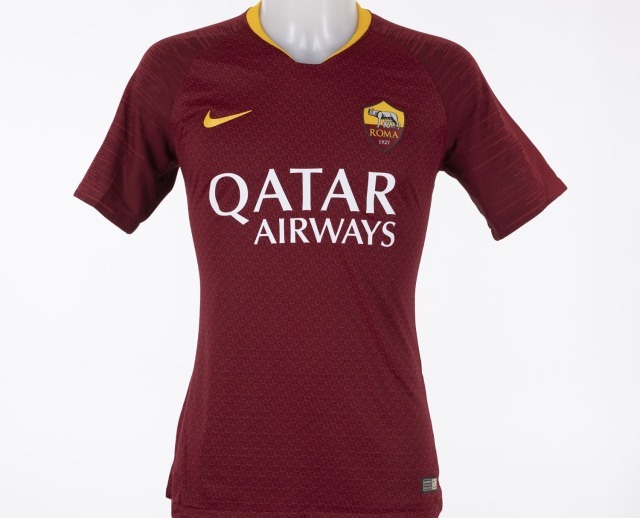 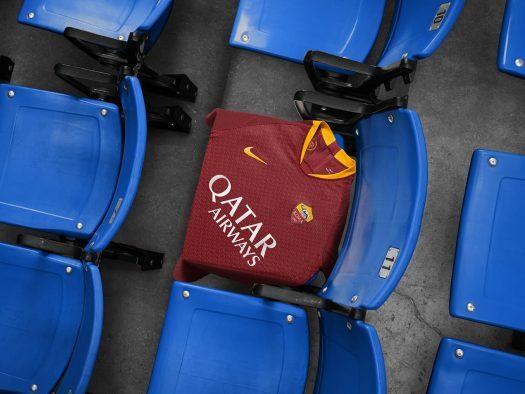 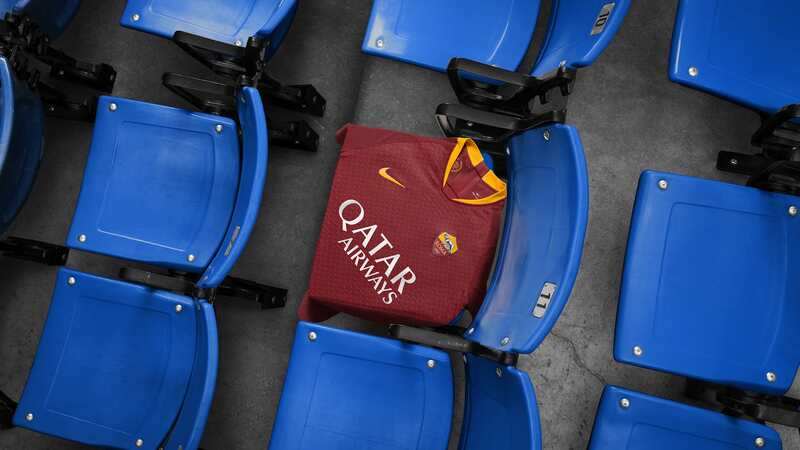 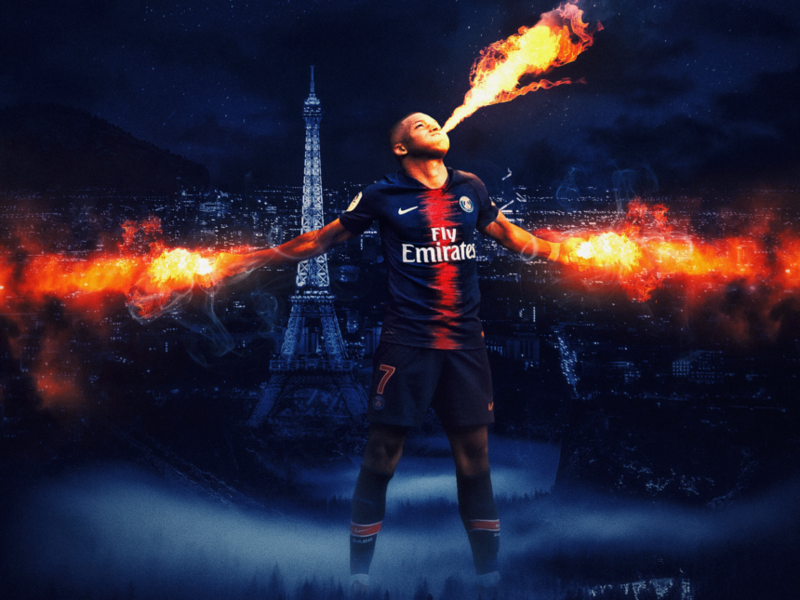 However, as Nike kits go these days the chainmail pattern appears to be unique to just Roma for now, which is encouraging, and it radiates an attractive and chic feel, although it lacks in creativity when compared to the recent fan-designed kits unveiled by the club this week. 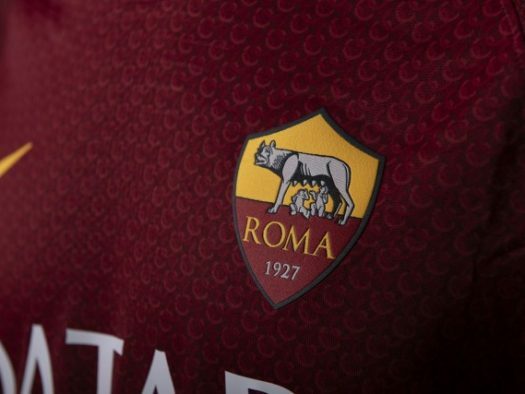 It remains to be seen what the Giallorossi’s 2nd and 3rd kits will look like, although the anticipated colour pattern of the third kit was leaked last month. 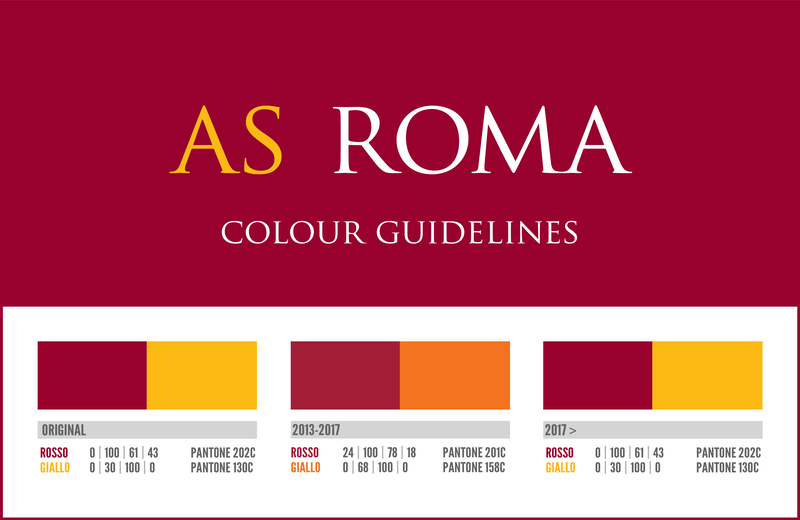 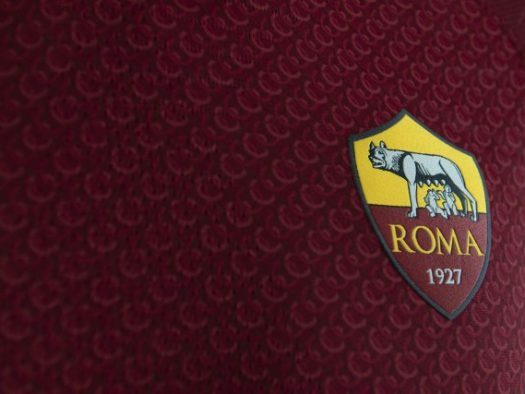 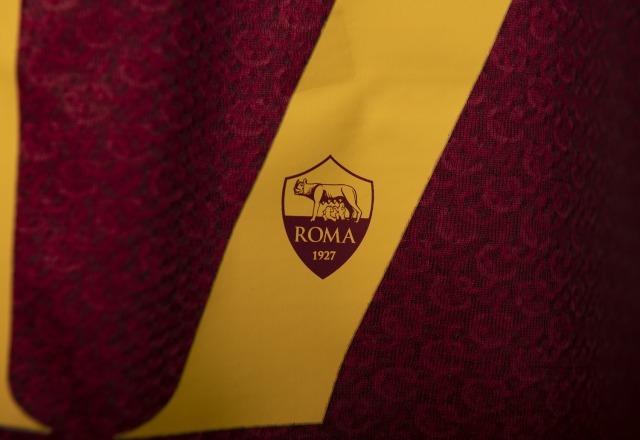 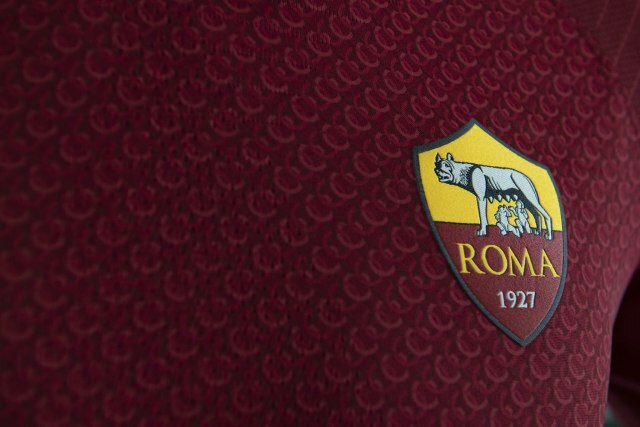 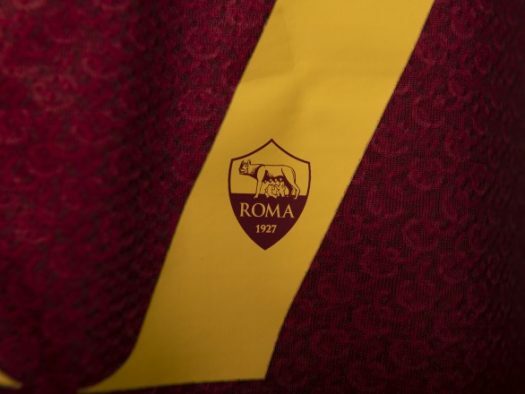 It also must be noted that for the new season AS Roma will revert back to the original red (Pantone 202c) and yellow (130c) used by the club (see colour guide above), having changed to darker tones from 2013-2017. 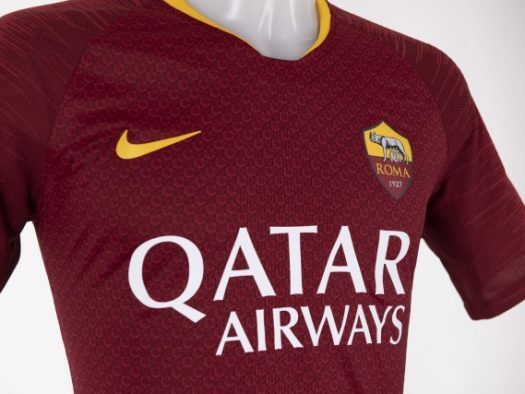 The brighter yellow gives a sharper edge to the trim, the Roma crest and the Nike logo. 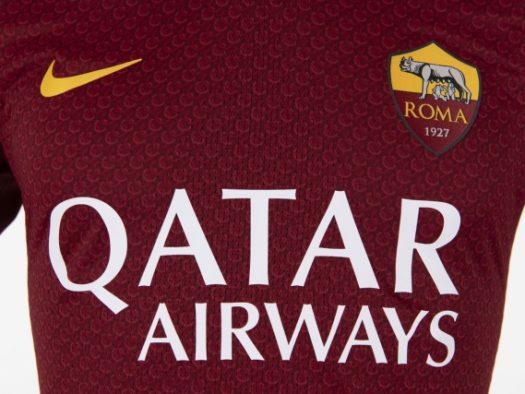 However, having Qatar Airways in white takes away from it a little when yellow could have worked better. 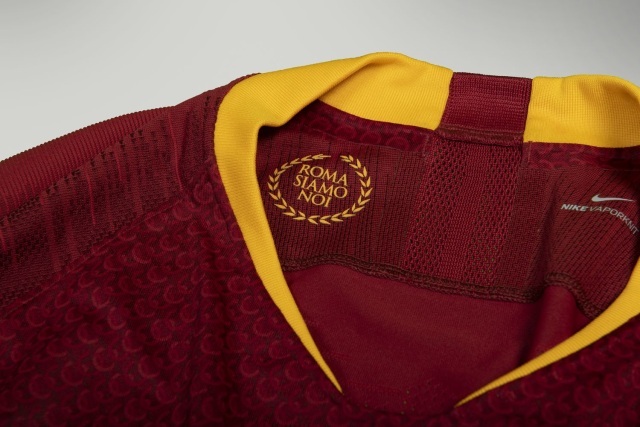 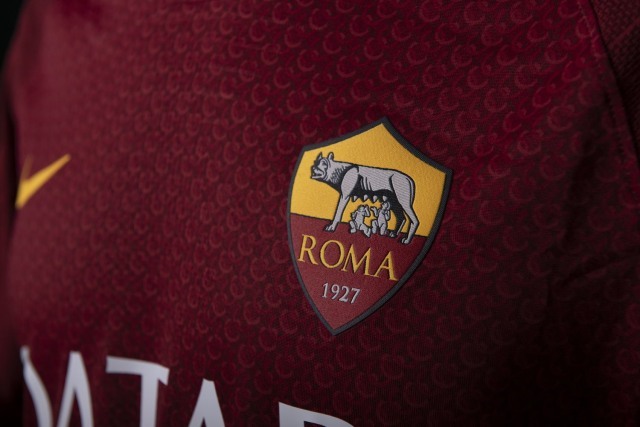 The player names and numbers on the back is a tall slab serif typeface, while the words Roma Siamo Noi adorns the inside neck of the shirt. 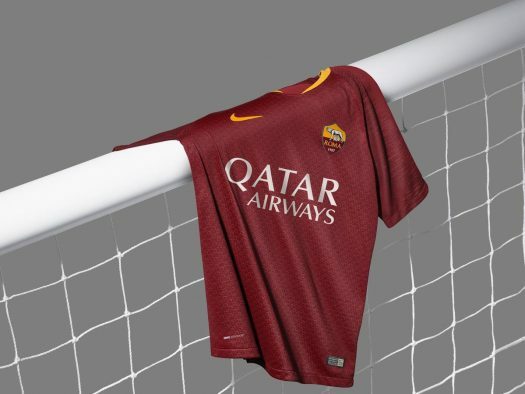 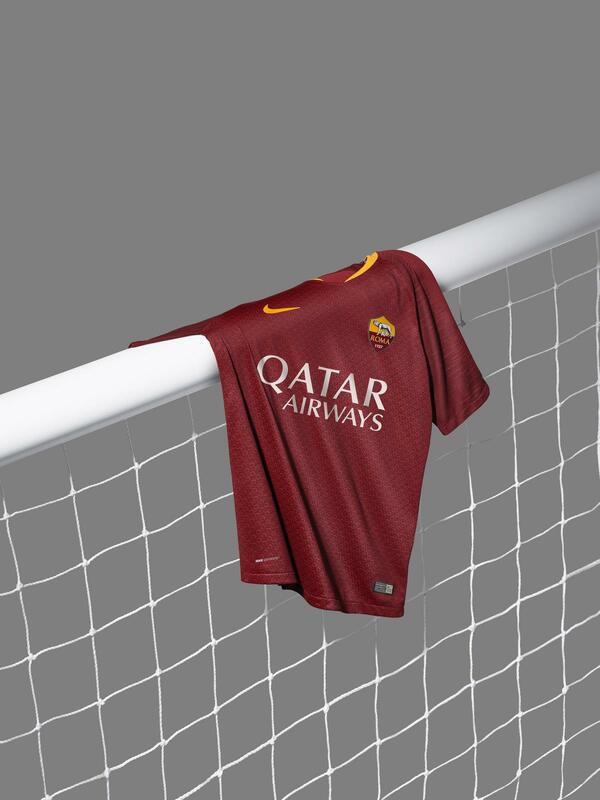 The new home shirt will be worn by Roma for the first time during Roma v Juventus in Serie A on Sunday, May 13, and goes on general sale from Monday 17 May, at ASRomaStore.com, AS Roma Stores and official Nike vendors.